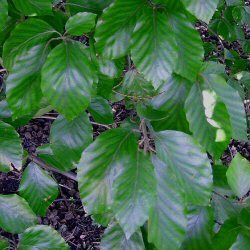 Common Beech is a British Native tree and is a well-loved part of the landscape. It makes a magnificent tree with attractive green leaves that turn a rich copper colour in the autumn. Common Beech as a tree is best suited to larger gardens or parkland settings, grown as a specimen in the lawn. However, it can make a great hedge, retaining the coppery leaves throughout winter and only loosing them when the new foliage develops in spring. Common Beech makes an attractive formal hedge that will act as a privacy screen and as a windbreak. 150-180cm These are supplied in the 5-12 litre range and usually 2-3 years old. 180-240cm These are supplied in the 7-15 litre range and usually 3-4 years old. This tree is supplied at a height of 1.5-2.2m in a 5-15L container for year round planting and better results than from bare-root stock. Expect a final height of 40m (133ft).